Christmas is closing by so I decided to cheer up our project meeting by creating a Christmas version of my WebGL minigolf game. It is now possible to play a hotseat multiplayer game with up to 10 players. 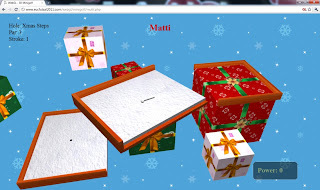 The game consists of three holes decorated with Christmas theme. "WebGL Inspector is a tool inspired by gDEBugger and PIX with the goal of making the development of advanced WebGL applications easier. What Firebug and Developer Tools are to HTML/JS, WebGL Inspector is to WebGL." QML content can be embedded into 3D world by rendering it on QGraphicsScene that is used as a texture for 3D object. See video below. As published by Qt-webpage, Qt WebKit Integration is an integration of WebKit with Qt. It provides an HTML browser engine that makes it easy to run web apps or embed web content into Qt applications. Qt WebKit supports HTML5 and WebGL specifications. 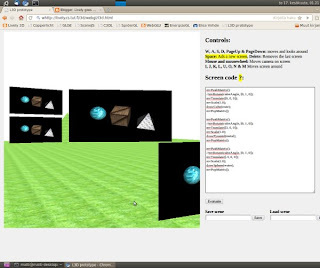 There is also a 3D Flickr HTML5 demo video available to demonstrate the HTML5 and WebGL possibilities with Qt. A WebGL seminar will be organized at Tampere University of Technology by Prof. Tommi Mikkonen and Dr. Antero Taivalsaari. The seminar will start at December 9, 2010 and end at spring 2011. In this seminar, WebGL and the emerging WebGL libraries will be investigated in the form of student presentations, application development exercises and group discussions. Students will prepare a presentation on one of the topics they choose, and will give a presentation in front of the seminar participants to summarize their findings. Students will also build sample applications using at least one of the libraries mentioned above. Learning WebGL blog has nice instructions how to enable WebGL in most popular web browsers. Command line is not necessary if a shortcut with the command parameter (--enable-webgl) is created for running the Chrome. On both demos the camera can be moved towards or away from the cube with mouse wheel. On the latter demo you can turn the cube with arrow keys. Please turn right first to avoid a weird bug. YouTube video is available here. 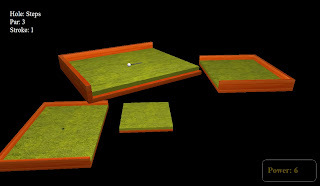 After a few weeks of coding I am happy enough to present you WebGL Minigolf: http://www.eucfutsal2011.com/webgl/minigolf/index.html The game is fully playable with 9 different holes. The physics engine is still under development and there are not even a pre-release available yet, but with a little debugging I was able to get the current version working acceptably. WebGL version of L3D has reached its' prototype phase. The first prototype is a technology demo for demonstrating the possibilities of WebGL. Demo bases on Learning WebGL-site's excellent WebGL tutorials. Live-demo to play with can be found here. During last few months numerous WebGL libraries have been appearing in fast pace. In the process of getting to know most advanced ones of these libraries, we have created some simple mashups that we would like to present. All these demos are "live" so you will need a WebGL enabled browser (Chromium and Minefield are recommended) to view them. Twitter avatars did not load properly with the latest Chromium (44073), but all worked fine with Minefield. To view the WebGL demos you need to have a WebGL enabled browser. Lively 3D builds upon our earlier experiences in creating the Lively Kernel, a dynamic programming environment embedded in a web page, and Lively for Qt, our implementation of a similar environment for Qt.